In the past, the only option for addressing multiple missing teeth was a partial denture. Dental implants are more stable and predictable than other tooth replacement options. In fact, dental implants are widely considered to be the most superior teeth replacement solution available today. At Desert Dental Alternatives in Palm Desert, CA, we place dental implants for multiple tooth replacement. Gone are the days of wobbly dentures. Here, we explore how dental implants can secure your prosthesis and improve your overall quality of life. Made from surgical-grade titanium, dental implants are tiny threaded posts that are inserted into the jawbone. Because implants replace the tooth’s root, they also stimulate the nerves in the jawbone. Therefore, existing bone is preserved, and future bone atrophy is prevented. Since implants are incredibly versatile, they can be restored with crowns, bridges, and dentures. Here, we focus on multiple teeth replacement using implants. If you have a row of missing teeth, you could choose a traditional bridge to fill in the gap. While effective, a traditional bridge requires the reduction of the adjacent teeth so they can serve as abutments for the restoration. This compromises the health of the teeth, making them more vulnerable to damage in the future. 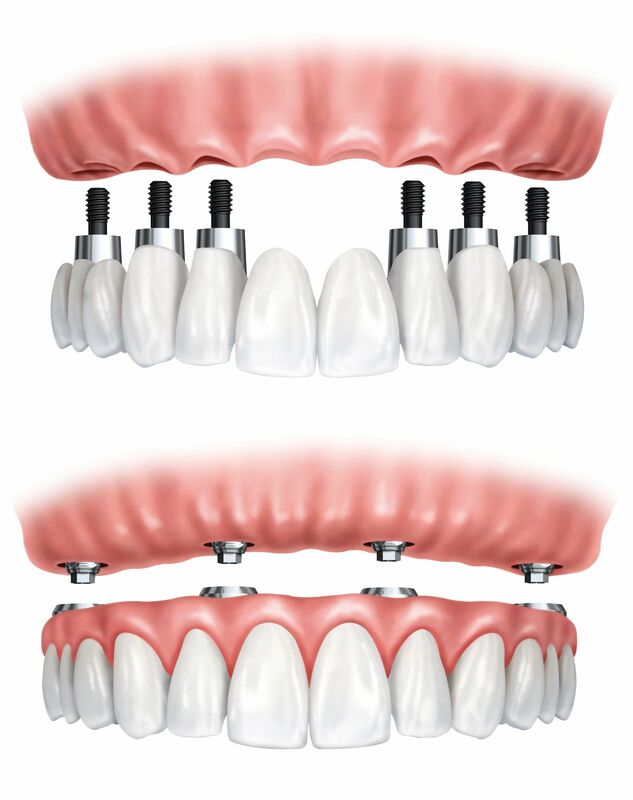 In contrast, an implant-supported bridge is secured to implants rather than the natural teeth. This preserves the natural tooth structure as well as jawbone density. Additionally, while conventional bridges last about 15 to 20 years, their implant-supported counterparts can last a lifetime with proper care. The advantages of implant-supported restorations do not stop there. If you have ever worn a full or partial denture, you understand the many challenges that accompany this type of prosthesis. For example, chewing, eating, and even speaking can be difficult. Because partial dentures are supported by the gum tissue and adjacent teeth, these appliances often slip out of place. An implant-supported prosthesis offers unparalleled stability, so you can eat all of your favorite foods without worry. Additionally, dental implants help preserve the natural jaw structure. Therefore, you will not develop a hollowed or “sunken-in” appearance, which is a common side effect of tooth loss. Those who seek dental implants for multiple tooth replacement will usually only require one surgical procedure. However, a few months of healing is typically necessary before the restoration can be attached to the implants. During this time, your jawbone will fuse to the implants in a process referred to as osseointegration. This will create a strong foundation for your new smile. Once osseointegration is complete, you will return to our office to have the abutments (connector posts) placed. Finally, your custom restoration will be attached using a bonding material or screw-retention. The result is a beautiful and fully functioning smile that will give your confidence a boost. If you are missing multiple teeth, consider what dental implants can do for you. To learn more about your eligibility for this type of treatment, schedule a consultation with Dr. Bruno Lemay. If you would like to speak to a team member first, we are always available to answer your questions. You can call our office at (760) 324-4450 or contact us online anytime.